Win a Fatpack of the Odette Set. Step 3: Comment under the Giveaway post: "done"
Step 4: The person with more likes on the post they shared will win the fatpacks (or 2 other fatpacks of their choice ). * Post must be publicly viewable and not set on private to qualify. 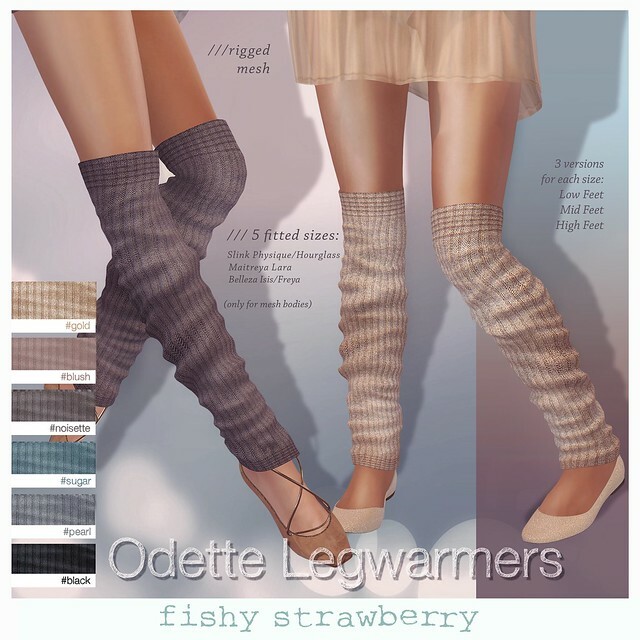 hmm lovely leg warmers with pretty colors! i like the length and thickness of them. its a guarantee they will keep me warm. thanks for sharing love, take care. I liked these warm Tights. These are really beautifully knitted and the colors are also impressive. Where can i buy them please share the details for online order. Your work is amazing. Second Life® and Linden Lab® are trademarks or registered trademarks of Linden Research, Inc. All rights reserved. No infringement is intended. This fansite is in no way affiliated or endorsed by either Linden Lab® or Second Life®.